I know what it’s like to be busy. I’m a single mom to five kids. I run my own business. I volunteer my time. I also help coach other female business owners and writers who want to find their way to financial freedom. Let’s just say, I always have something going on. So, I get it. I used to be really bad about slowing down, too. I was famous for saying I hated to sleep because it was “wasted time” and I took pride in how little I could sleep and still function the next day. Somewhere along the way, however, I realized that this is no way to go about life. You don’t always have to be on the hustle. In fact, if you’re hustlin’ all the damn time, there’s a good chance you’re doing something wrong. Life isn’t meant to be that way. Businesses aren’t meant to be ran that way. The beauty of entrepreneurship is that we don’t have to be that way. I talk to the women I coach about this regularly. It’s great to have goals and to chase after those goals like your life depended on it. But know when to slow down. Remember your self-care. Because we know that women have the tenacity to keep going no matter what. But here’s the thing… if you don’t take the time to slow down and take care of yourself, it WILL catch up to you. I was just recently talking about that work-life balance, and like the preachy mom saying, “Do as I say, not as I do”, I wasn’t living up to my own standard. I knew that I wasn’t, but I didn’t give myself time to fully realize it and I didn’t commit to changing it. I had good intentions, but I didn’t realize my own limits. I was pushing too hard. 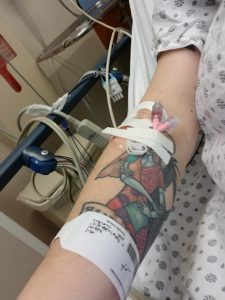 It caught up to me this week, and I ended up in the hospital. So, here I was being admitted to the hospital for the first time since I had voluntarily given my kidney to someone two years ago. I wasn’t the kind of person who ended up in the hospital. What was going on? 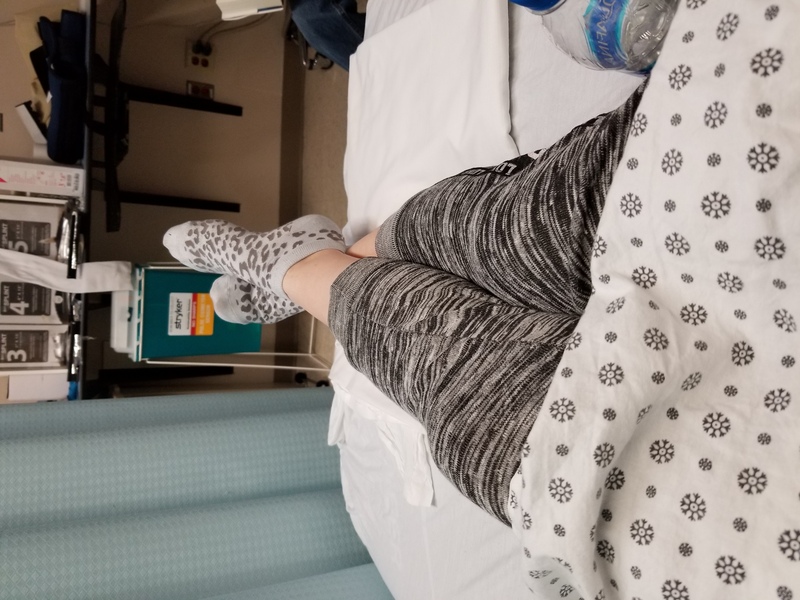 At first arrival to the hospital, they thought I was having a heart attack and they treated it like a heart attack, rushing me in and starting lots of tests and such. I was pretty sure it wasn’t an actual heart attack (my heart has always been healthy) but when the medical experts around you are all a’flutter, it can make you worry a bit, too. Turns out, that tachycardia was from my congenital heart valve defect and all the coffee I’d been chugging lately because I was trying to do too much. I also had some serious GI issues going on (and possible ulcers) also from the stress (and the coffee). I was working too hard and my body was screaming at me to stop and take care of it. 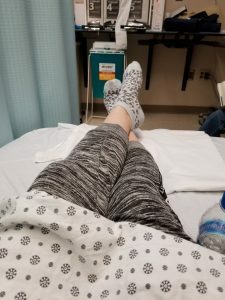 Now, I was stuck in an uncomfortable hospital bed worrying about my clients, my unanswered emails, all the articles and emails I needed to write, and that big pile of dirty dishes in the kitchen. Thankfully, my heart was fine – except for what we already knew I was born with – and they were able to get me some help for my immediate condition. I left with prescriptions and orders to see my doc, my cardiologist, and a GI doc. But mostly, I left with the realization that I need to slow down. I need to be aware of my limits. I need to remember to take care of myself. If you don’t slow down, if you don’t take care of yourself, you WILL be forced to eventually. How long you can go depends on the physical condition you’re in as well as other factors such as genetics, your diet and environment, and more, but it will always catch up to you. It might be catching up to you now and you don’t even realize it. How long have you had that ache in your back anyway? What about that migraine that never seems to go away? Finding yourself losing your temper more easily and more often? Yep. Your body is trying to tell you something. Don’t wait until you’re in the hospital with a needle in your arm (so sorry Jack and Sally!) to realize you’ve been pushing too hard. You can’t pour from an empty cup. Trying to push yourself too hard is like speeding when you’re already late. If you have an accident, you certainly won’t get there on time! It’s SO hard for me to slow down too! I feel like I ALWAYS need to be on the go. Yes! It’s so easy for it to just become a way of life, even if it’s not good for us. Sometimes it takes a big event to give us some perspective. I hope you are better now as it must have been pretty scary. I try to keep a good balance but we all get wrapped up into our plans. Thank you Carolyn, I am feeling better. Still trying to take it easy and do all of my follow-up appointments, but it was a good wake up call. I also have an explanation for some of that little weird stuff that was happening – my body trying to give me warning signs and I just wasn’t listening. You know I’m loving this post! Thanks for sharing your experience, Lisa. I’m glad you are healthy and I appreciate your reminder to us all! Thanks Charissa! Really appreciate you stopping by and I am also grateful. Sometimes we all need the reminder. I relate to this so much, sadly. I’ve been realizing lately that I have 2 speeds: 0 or 100. I just don’t know how to work in moderation and keep a good work/life balance. I have been noticing that it is getting in the way of my other life roles though so I really need to figure it out. You sharing about your hospitalization reminds me of when my mom was hospitalized because of stress-related complications. Thanks for this great reminder!